We had a feeling this one was in the works. After all, the last Honda Neo Sports Café Concept unveiled last year went from concept to production-ready in only a month, introducing the new CB1000R at the 2017 EICMA. 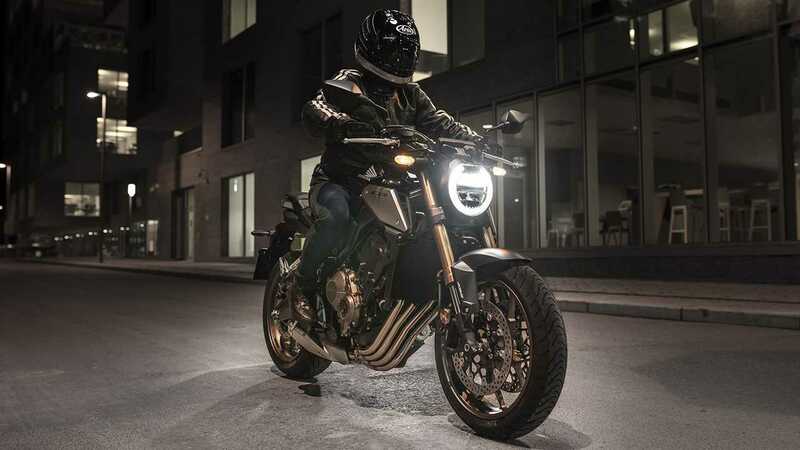 This year, a new iteration of the concept was shown at the Paris Motor Show a month ago and today, on the Milan stage, the new CB650R has made its debut. Joining the CB1000R and CB300R in the standard lineup as the middleweight champion, the all-new CB650R is the addition that loops the loop. The new model has nicely carried over most of the design cues from the concept, a design language introduced on the 1000 last year and that trickled into the 650. The R will replace the aged CB650F, giving the CB lineup a neo-retro flavor that both looks to history and to the future. The most noticeable feature of the new design is the round horseshoe headlight, the signature component of the CB’s new age look. An entirely new frame has helped make the new CB650R 13-lb lighter than the outgoing model. The new frame also accommodates a slightly lower handlebar, shifted forward, creating a more engaged and aggressive position.The front suspension is an adjustable Showa SFF fork, attached to a new wheel design and new Nissin brake hardware. It also features Honda’s selectable torque control feature, found notably on the Africa Twin, as well as an assist slip clutch. The CB650R is powered by an inline four fitted with a set of four striking downpipes, one for every cylinder, a wink at one of the best-known Hondas in history, the mid-70s CB400F. The new ensemble is completed by a big, color tool cluster display. Honda’s new look for its naked lineup tickles our fancy and we look forward to seeing the new 2019 CB650R hit the road and see for ourselves whether it’s as cool to drive as it looks.